Extract from pages 171-172 of H. Lamb’s 'Climate, History and the Modern World' 1982. The subject of the Medieval Warm Period is widely misunderstood. Not least because few today have read the works of the historian and meteorologist who first brought awareness of climate and its impact on human history to wide public attention. Europe has produced a number of pioneering climate historians; that diligently read manuscripts (e.g. the Anglo Saxon Chronicle) monastery records, manorial records of planting and harvesting dates, ecclesiastical histories, merchants' records, church tithes, port fees, tax records, military accounts, personal correspondence and so on. There were constraints of course: the Cold War meant information wasn't readily available for much of Eurasia, China turned against scholarship and relations with the wider world for a long period; SE Asia experienced decades of turmoil, in Vietnam and Cambodia especially. For other regions - e.g. Pacifica - simply not much was known about their past prior to Europeans arriving. Africa presented its own difficulties (as it does today), much was yet to be learnt about the past in the Americas and so on. The widely respected English researcher Hubert Lamb is the best known of these climate historians. Lamb coined the term 'Medieval Warm Epoch' (first used in 1965*) from his work, mainly on the European records available to him; today many know it as the Medieval Warm Period (MWP). Lamb wrote that he thought that this MWP was at its maximum between 1100 AD–1300 AD (he thought it peaked in the 11th century). Lamb published many papers and two major books: 'Climate: Present, Past and Future'. H. Lamb. (Vol. 1. 1972 & Vol. 2. 1977) on which his best-selling book 'Climate, History and the Modern World' (1982) was based. Lamb thought this period (MWP) fell within a period of European history known to historians as the High Middle Ages (1000-1299 AD), and wrote: "In England particularly it seems that there must have been less liability to frost in May in the period 1100 and 1300 AD.". Lamb connected it with art-historian Kenneth Clark's idea of this period being: "the first great awakening in European civilisation". [CHMW. 1982.) NB: There was a solar maximum -The Medieval Maximum - between 1075-1240 AD. See Note 1 at bottom of page. Climate change played a large part in ending the High Middle Ages and starting the period known as the Late Middle Ages.(1300-1499). A series of dreadfully wet summers from 1315 AD through to 1317 AD - and the resulting year-on-year crop failures - produced one of the worst famines in European history. NB: There was a solar minimum – The Wolf Minima – between 1290-1350. Very few today realise that Lamb believed that this MWP was a period of warmth (and highpoint of post Roman European civilisation thus far) that mainly affected lands surrounding the Atlantic and surrounding lands (mid-latitudes). For NW Europe it must also have been a period of regular rainfall; good harvests require good watering. Lamb thought the MWP was caused by the Circumpolar Vortex shifting its position towards the Pacific, along with the climatic zones it defined – see below. Read what Lamb wrote here. Above diagram from CHMW. Lamb. 1982. For the tree-line to continue extending upwards (above) between 01 AD - 800 AD, conditions had to have been consistently warm in these centuries to encourage this. From this Lamb estimated that Central Europe may have been between 1.0 degrees C and 1.4 degrees C warmer the 20th century average – up to 1980. (Interestingly, Lake Saki showed that the Crimea ended the MWP in the 1280s by entering into drought.) These temperature estimates are often quoted, but were not for the entire world; just western and central Europe. From 100 BC to AD 400 there was a warm, dry and stable climate in Europe and probably also elsewhere in Eurasia. Between 400 - 800 Europe generally had a colder and wetter climate. There may well have been warm summers, but the winters at least appear to have been colder. It culminated in ice appearing not only on the Bospherous and Black Sea (800-801) but even on the Nile in Egypt (829). These weren’t isolated winters. Glacier advances in the Alps reached as far forward as they did between 1550-1850. To set it in a context, in Europe at least, the period we call the Medieval Warm Period (MWP) was a period of recovery from cold. Rather than thinking of the MWP as a gloriously hot period, it should be seen as a period that was simply warmer than what had gone before. We associate the Little Ice Age with the famous Frost Fairs on the frozen River Thames of the 17th and 18th centuries. (Lamb. CHMW. 1982.) See also Note 2 at bottom of page. Yet, Lamb also found records of the Thames freezing in 923 and 998. Ice was reported on the Bospherous and the Nile in 1010/11. England's cold winters continued into the 11th century. The Thames froze for seven weeks in 1061. In England severe winters were noted in 1020, 1032/33, 1043/44, 1047, 1061, 1063, 1067/68, 1073/74, 1076/77, 1085/86, and 1092/93. In 1092/93 many rivers were recorded as being frozen so solidly that horses and wagons could travel on them. Later, that winter also saw a major flood (storm surge) caused by a storm in the Thames Estuary. 1066 had a long, hot summer, strong westerly winds in the English Channel prevented William, Duke of Normandy, from crossing until September to cross the English Channel and his joining in battle with King Harold’s army at Hastings. The years 1086, 1092 and 1098 were noted for extreme wetness. The 11th century also saw a high number of floods along the English east coast, presumably caused by storm surges. The Anglo Saxon Chronicle describes 1086 as a "very tiresome and sorrowful year . . . So unpropitiousness in weather no one can easily think." In 1092/93 many rivers were recorded as being frozen so solidly that horses and wagons could travel on them. That winter also saw a major flood (storm surge) in the Thames Estuary. According to legend (verifiable accounts are lacking) this was responsible for forming the 10 mile long sand bank in the English Channel, known as Goodwin Sands, by drowning (or carrying away) lands that formed the estate of the Earl of Goodwin. 1080-1180 saw favourable intervals of mild winters and dry summers in Western Europe (England, France, Germany). Anti-cyclonic weather brought warm summers, cold winters and low rainfall. The Anglo Saxon Chronicle described England in 1116/17 as very wet with localised flooding. Otherwise conditions seem to have comprised warm summers and cold winters. Drought is reported in 1102, 1114 and 1135-37. In 1114 the Thames in London was reported to be so low men that could wade across it at low tide. Notably harsh English winters were recorded in 1110/11, 1114/15, 1124/25, 1141/42, 1149/50, 1175/76 and 1178/79. The Thames was completely frozen over during the severe winter of 1149/50. In England there were some very hot summers - and drought - in 1212, 1214, 1222, 1252, 1253, 1255 and 1285. Noteworthy famines are reported in 1272, 1277, 1285 and 1292. 100-1300 saw mainly mild, wet winters in western Europe. The years 1284-1311 mainly had warm dry summers. In England the Thames froze over again in 1204/05 and in 1269/70 and 1281/82. Frost prevented ploughing and all work on the land was suspended from mid-January to late March; winter seed was destroyed and there was major famine. Other severe winters were noted in 1209/10, 1216/17, 1218/19, 1224/25, 1233/34. Other years saw noteworthy major storms and flooding of coastal areas, or flooding due to swollen rivers after thunderstorms or prolonged rainfall. I'm not at all surprised that there isn't a major global spike in temperature shown in temperature reconstructions for this period. There wouldn't be a clearly defined one if one were done just for Britain - a period of constant, sustained sunshine and warmth isn't reflected in the historical record; it shows immensely varied weather; with harsh winters as well as periods of warmth. I imagine the same is true for most regions. Claims that European cathedrals rose simply because of warm conditions are just romanticised history. Monumental buildings require: a) A stable, organised state. b) Economic prosperity. c) Peacetime. By the twelfth century France and Germany had achieved these after centuries of warfare, invasions and migrations. William's invasion of England enforced it on the English - cathedrals were a way of demonstrating Norman dominance. a) Population pressures on available land in Scandinavia. c) Technological progress: Scandinavian ships developed keels capable of supporting masts and sails; this made long-distance sea-travel feasible. Warmer climate was co-incidental; by sea their main targets were to the south: Britain, Germany, Europe's Atlantic coast and so into the Mediterranean; as well as Russia to the east. By 1215-1350 glaciers began to advance in several parts of Europe. Thick sea-ice on the Baltic allowed a German army to march from the mainland of Estonia to capture the islands of Muhu and Saaremaa in1227. The three dreadfully wet summers of 1315-1317 resulted in crop failure and one of the worst famines in European history. The MWP was over. 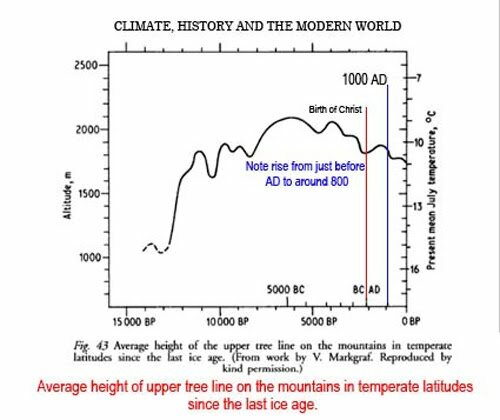 It is easier to distinguish The Little Ice Age as a distinct climatic period than the MWP, particularly in the N. Hemisphere. but the LIA's effects fade the further south you look. It is very difficult at times to see any periods where all continents or regions were similarly affected, all at the same time; in other words, that the MWP and LIA truly were simultaneous global events. We imagine the MWP as a romanticised European golden age of bountiful harvests. We don't picture it as a time of varied weather; with many harsh winters as well as periods of warmth. Nor as what North, Central and South America experienced - a time of 'mega-droughts' and immense floods, when major civilisations [Moche, Teotihuacan, Maya, Tiwanaku, Wari, Sican, Chimu and Anasazi] collapsed. An American climate researcher (S. Stein) has suggested that for the Americas, a better term would be the 'Medieval Climatic Anomaly' to distinguish the major differences between the overlapping Eurasian (MWP) and American (MCA) climate periods. Lamb's work is now decades out of date and has been widely misquoted and misunderstood since publication. The very wide variety of dates given for the MWP shows the confusion. Inevitably the results of more recent research, by historians (Burroughs, Fagan etc. ), archaeologists and archivists in many countries and continents (as well as proxies that were largely unavailable to Lamb) means that much more detailed information is now available; it needs to be pulled together to build a new global picture, though it would be a major task. There was a solar minimum – The Wolf Minima – between 1290-1350. There was a solar minimum – the Spörer Minimum – between 1450-1540. There was a solar minimum – the Maunder Minimum – between 1645-1715. Note 2: The last time the Thames froze over was in 1813/14. After this London Bridge was rebuilt and other work done along the river Thames so that ships could have greater passage. This allows more water to flow and a freezing of the tidal reaches has not happened since. Note 3: The Little Ice Age was a period of remarkable volcanic activity: an aver­age of five major eruptions per century that equalled the intensity of the Krakatoa eruption in 1883. The first major eruption was in 1259. There were four other major volcanic eruptions in the 19th Century: on St. Vincent in the Caribbean In 1812, Mayon in the Philippines in 1814, Krakatau in Indonesia in 1833 and Coseguina in Nicaragua in 1835. These also helped cool the weather in that year and following years. 1816 was coldest single year on record in many places in Europe and North America, following the massive 1815 eruption of Mount Tambora in Indonesia. The following year, 1816, has gone down in folklore as ‘the year without summer’. Up to 15cm of snow fell in New England in June; crops failed across Europe resulting in major food shortages and famine again struck Europe between 1816-1820. This resulted in a massive wave of emigration to America. This period saw the coldest summer temperatures the Low Countries in Europe would experience between 800-2000. The Smithsonian Institute maintains a list of identified major Holocene volcanic eruptions. It can be reached through this link. There's a list of major volcanic eruptions between 1 AD and 1900 AD on this page. Note: It is my hope to use the pages of this site to further explore the climate changes of the past 2000 years, by drawing upon modern research from many fields and relating it to how it impacted on human societies. There is now much more evidence than was available to Lamb when he was working over 30 years ago. Developments in solving the mystery of the Maya collapse are one example. Inevitably some of Lamb's assumptions will be found to have been proved correct – as with the Maya drought – in others his hypotheses may have to be readdressed in the light of new evidence. In other instances work on climate regimes on various continents have opened up new lines of exploration that were unknown in his day. The growing understanding of the importance of the interactions of the cycling oscillations of currents of warm and cool waters in various oceans and their interactions with the atmosphere is one such example. Likewise, archaeologists and historians have been busy since his day, much more is known now than was available to Lamb. Particularly regarding regions, periods and peoples that were virtually unknown in the 1960s 1970's and early 1980s. The pre Columbian Mesoamerican and South American civilisations and all the pre Columbian events covered on this site are an example. Note: April 2009. I am currently working on North America, the great North American megadroughts, the cool eastern Pacific of the Medieval Warm Period plus the medieval climatic anomaly that has been identified, and hope to have something ready by summer 2009. This site is currently a work in progress, so more material will be added over time. Please bookmark this site. If you like it please link to it.